Today's world is into mobility. One of the biggest challenges for me in adjusting to my new setting in Cambodia has been a loss of mobility. No longer can I jump in my car and conveniently go wherever I want on a moment's notice. For most of my first couple of weeks my options for getting around were 1. walk, 2. bum a ride off of a friend (whether that be by car or motorcycle), or 3. hire a tuk tuk. I am grateful for these options, but they sometimes feel very limiting in comparison to the freedom that I was used to. It gives me yet another opportunity to depend on God, however, and He has graciously been providing for me. Last Monday a friend took me bike shopping and I found a bicycle - used, but in really good shape. Additionally, God answered my prayers about my transportation needs by helping me to find a great tuk tuk driver, one who is kind, honest, and dependable! I can't begin to express how thankful I am for this - it allows me to get a lot of things done that would be much harder to do otherwise while feeling relatively secure. Since for now I will be using my bike the most, I do ask for your prayers for safety as I am learning how to navigate the traffic here with my bike. I feel quite stressed when I am in a lot of traffic, which happens fairly often, and I did have one kind of scary incident which shook me up a little. I know it will improve as I continue to practice getting around this way. One of the things I love when reading Bible stories is seeing how patient God is with His servants. When I look at guys like Gideon, Moses, and Jonah, and how God uses them despite their struggles with trusting Him, I know there’s hope for me. A few days ago I experienced one of those instances of God’s tender, patient provision for me in my weakness. During language acquisition training at MTI, we were exhorted to of dive in right away, start practicing our new language in our communities, view language learning as ministry, etc. all of which sounded wonderful and exciting to me at the time. I don't think I take myself too seriously in general. I'm willing to be laughed at and I really love people, so what would be the problem? Then I got here and, while part of me wanted so badly to take the plunge just as they had encouraged us to do, another part of me really struggled with it. I've had one full, intense week of one-on-one Khmer lessons (2 hours/day for 5 days) but getting out to practice was harder for me than I thought it would be. I knew it was time to start pushing myself further out of my comfort zone. So, one morning as I was heading out the door (a little later than I had intended) I just started praying and confessed to the Lord my fear, asking Him to direct me to the right people in my community to help me practice language, the people He knew would be able to encourage me, and with whom I could possibly develop relationships and eventually share His good news. I made my first stop at a little cafe very close to my apartment. The place was empty except for two employees, a man and a woman. I ordered a frappe and then started practicing some of my conversational Khmer phrases with the young lady. There was one word that I was mispronouncing that she tried repeatedly to correct me on. After numerous tries I finally got it satisfactorily, but by that time I felt like they must be thoroughly frustrated with me so I took my drink and sat down at a table. To my delight, the young woman came and sat at a booth next to me to continue talking. She was very friendly and expressed willingness to help me in the future. I was so encouraged by this very immediate answer to my desperate prayer just minutes earlier. It made it so much easier to talk to a number of other people afterward and I'm seeing more and more opportunities open up, including another young lady who is a school teacher and lives on my street. She and I talked tonight and are going to meet tomorrow so that she can help teach me Khmer and I can teach her a little English! Lots of fun - but good-bye is still hard! Last week, as I walked out of the house to head to the airport a little after 4:00 on Monday morning one of my family members said that the gas was low in the van so we were going to have to take another vehicle. In my groggy state and without my glasses on yet, it took me a minute to realize that the vehicle they had in mind was the 10-passenger limo they had rented so we could all ride to the airport together in style. 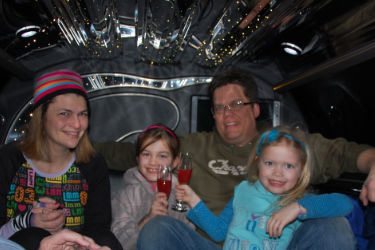 My first ever limo ride! It was such a fun way to be sent out and I'm so grateful to my family for making it such a special and memorable event. When people hear about my being a missionary I often get asked, "Is your family supportive of you?" Well this is just one little example of the wonderful love and support my family has shown me throughout this process of preparing to go. I'm so very thankful for them and I ask for your prayers for them. While they do support my going, it's not easy for any of us to have me so far away. Missionaries' families pay a price for their missionary's call, so please remember to lift them up as well!